Millwall will play host to Stoke City in the Sky Bet Championship. This game is being played at 1:30pm on 27 April 2019 at The Den. 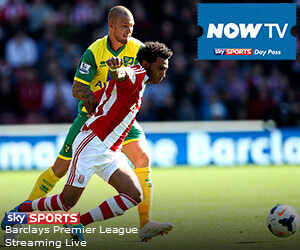 Which TV channel are Stoke City on and can I live stream it? You can watch this game live on Live Stream, and you can tune in at 1:30pm for all the action. Want to know when Stoke City are next playing live football on TV and on which channel? This Stoke City on TV Schedule is updated daily to make sure you know when and who they are playing on TV across all satellite and freeview channels in the UK including Sky Sports, BT Sport, BBC, ITV and on official live streams. So, If you are trying to check out if Stoke City are on TV today, tonight, tomorrow, or this weekend, make sure you sign up to check our Football on TV Listings which shows Stoke City's upcoming live Football fixtures for the month ahead. There are several ways to watch the next Stoke City game on TV or online - check out our Stoke City Live Stream. This Stoke City TV schedule was updated on 22 April 2019.